We, Bangalore Vacuum Technology, set up our operations in the year 2004, are known for manufacturing, supplying and trading Vacuum Furnaces & Vessels. The product range offered by us is inclusive of Vacuum Furnaces, Drying Ovens and Helium Gas Leak Detectors. These furnaces & pumps are manufactured from quality assured metals and alloys that are sourced from trusted and reliable vendors in the industry. Owing to their easy operation, energy efficient design, minimum maintenance, durable construction and longer serving life, these vacuum furnaces are highly appreciated among our customers. Some of the sectors where the offered products find wide applications are biological and nuclear & atomic research. In addition to this, the offered vacuum furnaces are highly appreciated among our customers for space & semi-conductor industries. Supported by a team of skilled professionals, we work to attain maximum customer approval and satisfaction. We assure that the premium quality of the offered range of vacuum furnaces is never compromised at our end. By accepting vapourware has helped us in catering to the precise needs of the esteemed customers. BARC Mumbai, BARC Mysore, IIAP Bangalore and ISRO Bangalore, are some of our valuable customers that are associated with us over a long period of time. s modes of payment, we keep the convenience of our customers in mind. Moreover, we assure delivery of the offered range of vacuum furnaces within the assured time frame at the customers’ end. Mr. K. Parameshwara has helped us in catering to the precise needs of the esteemed customers. BARC Mumbai, BARC Mysore, IIAP Bangalore and ISRO Bangalore, are some of our valuable customers that are associated with us over a long period of time. We are in the field of manufacturing of below equipment from past 15 years. We also undertake Annual Maintenance Contract (AMC) for all types of vacuum related projects & Servicing of Vacuum Pumps and any vacuum related. 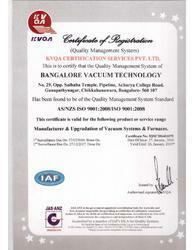 Our Quality is assured with the ISO Certification given from KVQA of International Accreditation Form. We are registered and certified by The National Small Industries Corporation Limited (NSIC). We are also Registered with DMRL, DRDO, Kanchanbagh, Hyderabad. Manufacturing, Services and Trading of Vacuum Furnaces, Drying Ovens, Helium Gas Leak Detectors, Pressure Control Valves, Vacuum Pumps, Vacuum Chambers and many more. ”The quality of our work depends on the quality of our people and satisfaction of the customer”. Our skilled, dynamic and enthusiastic engineers put in their meticulous efforts towards achieving the organizational goals. We have been supported by a team of professionals who hold expertise in their area of work and are trained on a regular basis, to enhance their technical and professional skills in the most efficient manner. Our team consists of skillful and experienced professionals such as production managers, quality controllers, warehouse-in-charge and other support staff. Based on their experience, knowledge, and skill, our professionals are appointed by our management after conducting rigorous selection procedures. Our enter into the industry of 10 years has given us abundant insights of the market and helped us scale exceptional heights in the field. “Bangalore Vacuum Technology” have established as a reckoned name in the field of manufacturing and supplying of Vacuum Systems, Vacuum Fluids, Components & Accessories, Gas distribution systems, Pharma Equipments. We even offer Vacuum Pumping System, Turbo Pumping System, Impegration Plant, Vacuum Chambers, Rotary Vacuum Pumps, Diffusion Pumps, Butterfly Valves, Right Angle Valves, and Vacuum Thin Film Coating Units. Our product range is highly acclaimed for excellent performance, rugged construction, durability and easy installation & maintenance. Our product range is used in many areas like R&D, educational institutions, space & semi-conductor industries, laboratories, nuclear & atomic research, biological, and micro electronics. Our adherence to strict quality measures has enabled us in gaining a rich client-base across the country and backed by a state-of-the-art manufacturing facility and diligent team of professionals, we are able to manufacture a faultless product range. We work mutually with clients to meet up all their specific requirements. For more than a decade now, the Company has been stead-fastly expending considerable resources on developing technology required for various high technological applications in space, defence sectors, forging, automobile, semiconductor, nuclear energy, electronic industries. While continuing to augment and upgrade its own man power, R&D and its manufacturing processes, it has also associated with leading global manufacturers to access latest technology, and become a reliable supplier to them. We have established a huge infrastructure and appointed a team of experts, to meet the desires and expectation of our customers in the most efficient manner. Large production capacity and rich vendor base have helped us in meeting the bulk assignments in the most organized and planned manner. Rigorous quality assurance procedures conducted by our team of quality controllers ensure that the premium and superior quality of the offered vacuum pumps is never compromised at our end. Being a reputed name, we believe in making and maintaining a mutually beneficial relationship with our customers. For this, we follow complete transparency in all the business dealings. in addition to this, we follow moral polices and professional approach while interacting with our customers, for attaining maximum customer approval. Customized packaging and different payment modes are offered, keeping in mind the convenience of our customers in mind. •Bharat Electronics Ltd., - Bangalore. •Bharat Electronics Ltd., - Machalipatam. •Institute of Animal Health & Veterinary Biologicals – Bangalore. •Siddaganga Institute of Technology, Tumkur, Karnataka. •Jindal Aluminium Ltd., – Bangalore.